These microwaveable bowl holders go in the microwave with bowls in them so that you can safely remove a hot dish without having to maneuver a potholder around an awkwardly sized very hot bowl. They're so cute you can even serve meals in them! They are great for holding hot dishes while watching television, so they're perfect for serving bowls of chili as you gather friends for the big game. They're also washable in case of spills. It's important to make these potholders from 100% cotton to avoid any risk of fire or melting. Always preshrink your fabric so that it won't shrink after being washed. You can make just one, or a whole stack of them! 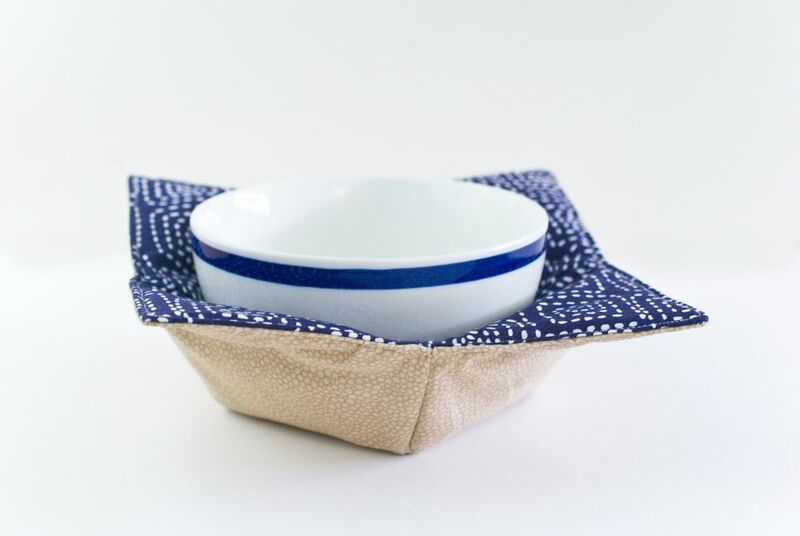 If you are only going to make one or two microwavable bowl potholders you can easily skip this step but if you are making them as gifts, it helps to take the time to make a template. The time you save re-measuring and marking each piece will easily be made up and saved by using this template instead. You will need poster board or card stock for this step. Cut out a square for the size microwave bowl potholder you will be making. The examples are made with 10" squares, but you can make other sizes for larger bowls. Be sure your squares are truly square and even. Using rotary cutting tools is extremely helpful for making a perfect square. Remember that using your fabric cutting tools to cut any form of paper will dull them. Use an old blade or use the rulers to mark out a square and then use your paper scissors to cut it out. Mark 4", 5" and 6" from the ends on each side and 2 1/4" in toward the center of the square at the center 5" mark. Mark 5", 6" and 7" from the ends on each side and 2 1/2" in toward the center at the 6" mark. Mark 6". 7" and 8" from the ends on each side and 2 3/4" in toward the center at the 7" mark. Now use an eyelet or another punching tool, or even a large needle, to punch the marks you have made on the square, with the edge marking holes about a 1/4" in from the edge. For each bowl potholder, you will need to cut out two fabric squares and two batting squares. Use rotary cutting tools for accuracy. Stack like colors together so you can change machine thread color as infrequently as possible. Cotton thread is not available in the array of colors that all-purpose thread is for garment sewing so you will rarely be ​an exactly matching thread. When making many bowl holders, finish one color before changing the sewing machine color to use another thread color. On each square of batting, transfer the markings from your template. Place the template on top of a batting square, aligning all the edges. Use a fine tip marker that is close to the color fabric you will be using or a vanishing ink fabric marker or tailor's chalk. Place the tip of whatever fabric marking tool you are using through each hole on the template, marking the batting in the process. Continue through the pile of batting squares until they are all marked. Pick up a fabric square and a batting square. Place the batting on the wrong side of the fabric, aligning all the edges. Sew across each square starting at the center marking, through the mark in from the edge, to the opposite side. Repeat so you have sewn across both sides of the fabric forming a cross that intersects in the center of the square. If you need assistance sewing a straight line across the fabric, set up a seam guide on the sewing machine. Optional: sew from each corner to the opposite corner for added quilting. Without putting the batting and fabric square down, fold the fabric so the right sides of the fabric are together along one of the first quilting lines. Sew from the marking that is one inch from the top center marking to the center marking that is several inches from the edge, creating a dart. Although you do not normally back-stitch at the end of a dart, in this case, the darts can be back-stitched to secure the pointed end of the dart, as the batting absorbs any bulk that the back-stitching may create. Plus it is much faster than tying off the thread ends. Without unfolding the fabric, sew the dart on the opposite edge of the fabric. Unfold the fabric and fold the other quilted line. Repeat to sew the darts in the ends of the remaining sides of the fabric. Set the sewn fabric aside and repeat until the entire pile of like colored fabric is sewn to this point. With the fabric sides up, press all of the darts in one direction. You will speed up the process and save electricity by doing all of the pressing at one time. Working with the fabric up and the bowl indented allows you to flip the bowl so you work your way around the edge of each bowl. Trim each dart to about a 1/4" seam allowance. After the darts are trimmed, nest each one with the chosen opposite side so that you will have them together for the next step. Align the remaining edges and pin together. Start sewing on one edge of a bowl just before a dart, using the pressure foot as a seam guide for an approximately 1/4" seam allowance. Sew around the edges, pivoting at the corners and stopping just past the last corner so that there is an opening to turn them right sides out. Trim the corners of each bowl. Continue sewing the sets until they are all complete. Turn each bowl right side out. Using a tool such as a barely sharpened dowel or a letter opener that is not sharp, push out the corners on each bowl. Return to the iron and press, opening the seams. Where the opening is, press so that the seam allowance is tucked in and pressed under evenly as if it was sewn. Return to the sewing machine. Top stitch the entire top edge of each bowl, close to the edge so that the opening is sewn closed and the entire top edge is held in place with the seam at the very edge. Create a stack of the bowls as you finish them. Press again if desired. Most bowls will fall ​into place within the bowl warmer. Change the sewing machine thread color and start your next grouping of bowl holders! Before you turn the bowls right side out take a quick look at all the edges and be sure you have caught all the layers of fabric in a seam. Re-sew if necessary. To turn the bowls right side out, place your thumb and index finger into the part you left open and reach for the furthest corner. Pull that corner through the opening and the rest will follow. Use two different prints or fabrics, and when you are done stack them so a different side is up on each pile for a pretty visual effect. Keep your top-stitching straight and an even distance from the edge of the potholder by using a guide on the presser foot or the machine bed rather than watching the needle.